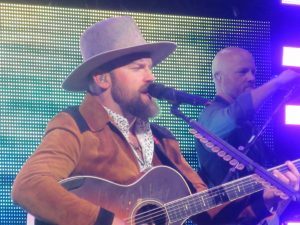 Last night, Zac Brown Band kicked off their new Black Out The Sun Tour in Hartford, Connecticut and absolutely captivated a sold out crowd. This show had a little bit of everything for the music fan in everyone, from country to rock, with a little reggae and electronic mixed therein. 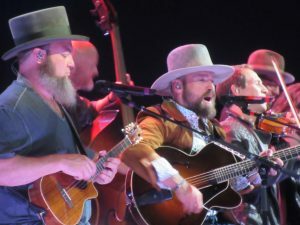 More than anything, what separates a ZBB live show is the fact that, every night of the tour, you are going to get a completely different setlist, not the same 18 songs in the same order like most of the other acts out there touring. Of course, this was night one of the tour, but you could tell the song choices were strategically chosen and masterfully executed. For anyone who has been to a ZBB show before, a highlight is always what covers are they going to play. Because, not only are they a band who has pumped out 15 #1 hits and 4 #1 albums, but they are probably the best cover band out there as well. In years past, I’ve seen them cover songs from Metallica, Rage Against the Machine, Bob Marley, Tom Petty, Queen, and so many more. This night did not disappoint in the least, as they performed four amazing and very diverse cover songs: “No Way No” by Magic, “S.O.B.” by Nathaniel Riley, “Wrong Way” by Sublime, and “Teenage Wasteland” by The Who. Yes, you did not read those four titles wrong. 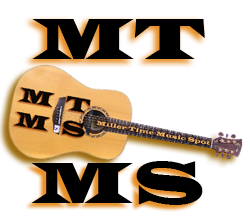 On top of it all were the hits, like “Homegrown”, “Toes” and “Chicken Fried”, as well as a great acoustic portion which featured “Sweet Annie”, “Colder Weather”, and a rare song found on ZBB’s first album which was an independent release, called “On This Train”. 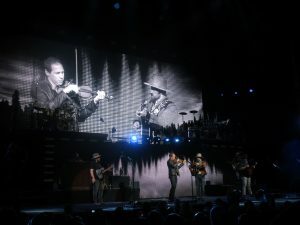 Only the diehard ZBB fans know about that album, and many having been dying to hear that song live, which was a special treat. The stage was intense, with multiple levels, a new horn section, and graphics that were very high tech. During the song “Tomorrow Never Comes”, the Black Sun illuminated the entire amphitheater and turned it into an intense rave with trippy colors and the band jumping in unison. Overall, the show is a can’t miss this summer from music’s most talented live band. And not to be overlooked in the least, was Drake White & The Big Fire, who opened the show to much intrigue and acceptance. Sometimes being a relatively unknown act without an album for fans to get exposed to your music may be held against an artist in a live setting. 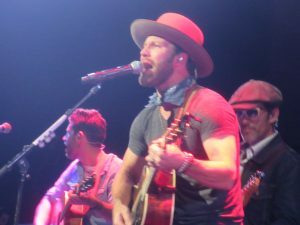 However, Drake White took to the stage with the performing swagger of a season veteran. 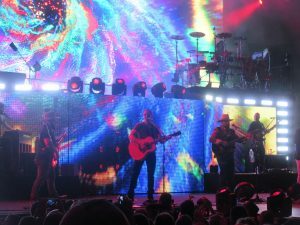 He pumped out country anthems such as “Back To Free” and “Living The Dream” as well as feeding to the ZBB crowd with covers such as a Beatles classic. “It Feels Good” had the crowd grooving as Drake used every inch of the stage and showed no signs of being a rookie. I caught up with him after his show and he told me he was excited about his first album and that he is shooting for an August release date. Fans need to get ready, because he is going to be around for a long time.